Our next TRACOM Social Style Certification Dates are 8/9th June 2017. 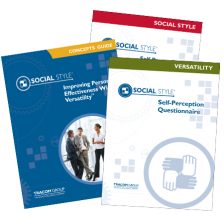 SOCIAL STYLE Products are available in Self Perception versions as well as Multi-Rater (often referred to as 360) versions. There is no certification needed to use the Self Perception Profiles. Becoming a TRACOM Certified Facilitator / Instructor enables a person to teach the powerful SOCIAL STYLE Model to others. Certification is required to use TRACOM’s multi-rater profiles (assessments) and facilitate many SOCIAL STYLE programs and courses. As part of any Certification you will receive a comprehensive Certification Kit and the knowledge, resources and skills necessary to facilitate the concepts of Social Style and Versatility in training sessions or during one to one coaching. To enrol or find out more information on our next Certification Workshop just follow the link below. You will be able to pay by credit card or if you prefer to pay on invoice, please click on the additional payment options button and request us to send you an invoice.